B. Ashok couldn't be happier. The Chairman and Managing Director of Indian Oil Corporation, or IOC, doesn't have to run around meeting officials, unlike his predecessors, to seek permission for every piffling increase in prices and timely/sufficient compensation for selling products below market rates. With the dismantling of price control on fuels such as petrol and diesel, the days of being a supplicant are over - the company now has the freedom to sell most of its products at market rates. This is showing in revenue/profit numbers. IOC reported an 85 per cent jump in profit to Rs 11,391 crore in the first half of 2016/17, despite the dip in revenue from Rs 2,11,043 crore to Rs 2,07,475 crore. This is after a Rs 10,399 crore profit in 2015/16, almost double from Rs 5,273 crore in 2014/15. This is the biggest-ever jump in profits of the country's biggest company by revenues. IOC's main competitors, BPCL and HPCL, reported 66 per cent and 41 per cent rise in net profits, respectively, during the year. The rise in profits could not have come at a better time for IOC. It is in the middle of implementing some big projects. It is, for instance, anchoring the government scheme to provide LPG connections to all below poverty line households. 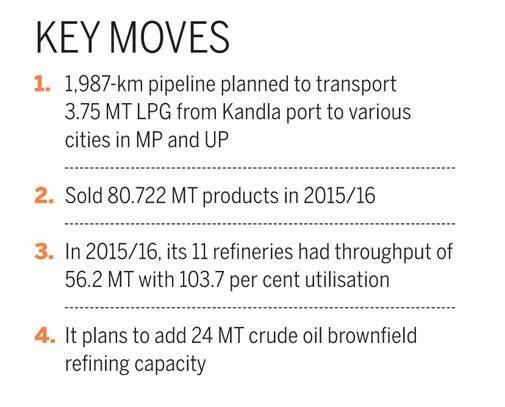 This will require big investments in building infrastructure for importing and transporting LPG, including laying the ambitious 1,987-km pipeline for transporting 3.75 MT LPG from Kandla port to cities in Madhya Pradesh and Uttar Pradesh. The profits will also ensure that it has the resources to upgrade refineries as part of a government plan to shift to the BS-VI fuel in a few years for which the cost will come to around Rs 30,000 crore. While Ashok has had his share of luck, the company has taken a few critical decisions to improve operational efficiencies during his tenure. On July 16, 2014, when he took charge, a barrel of crude oil cost $108. Today, it is available for less than $50. This has led to a spike in gross refining margins, or GRMs, of most OMCs. In October, for instance, the benchmark Singapore GRM rose 50 per cent to $7.2 per barrel from $4.82 a barrel in June due to higher margins on gasoline and fuel oil. Fall in oil prices also ensured robust demand growth in spite of the economic slowdown. It was also the reason the NDA government could dismantle the subsidy regime with ease that was unthinkable a few years ago. The government's approach also helped. From January 2016, it started paying LPG subsidy directly to bank accounts of citizens. This plugged pilferage, brought in fiscal discipline, and improved cash flows. A predecessor of Ashok remembers the problems of his tenure. "Crude oil prices were high. So was the amount of under-recoveries. There was uncertainty if the government would compensate OMCs, and when and by how much. In some cases, the money didn't come at all," he says. IOC, as a result, had to borrow heavily from markets even to run daily operations. At the peak, its annual borrowings were close to Rs 1,00,000 crore. The freedom to price products changed this. Interest costs dipped from Rs 5,084 crore in 2013/14 to Rs 3,435 crore in 2014/15; in 2015/16, they were Rs 3,000 crore. The Reserve Bank of India decision to reduce rates also helped. All this gave Ashok the freedom to re-engineer many operational aspects that his predecessors couldn't do. For instance, due to low oil prices, the company is nowadays relying more on spot market purchases, which are cheaper. This is ensuring better inventory management. "To make the purchases swifter, we close the deals within 36 hours," says Ashok, the first insider to head IOC after M.S. Ramachandran retired in March 2005. He has also been juggling the sources of crude oil and configuration of refineries. "Most of our refineries are either modern or we are investing to upgrade them. We are constantly working on either developing cocktails of crude oil variants acceptable to the particular technology of the refinery or improving the technology altogether. This allows us to buy different varieties of crude oil," he says. IOC owns 11 out of India's 23 refineries. Its consolidated refining capacity is 80.7 MT per annum, 35 per cent of the national total. Ashok is trying hard to ensure that the refineries keep shutdowns to a minimum. In the previous financial year, the 11 refineries used 103.7 per cent capacity and sold 80.722 MT products. IOC is looking to build an additional 24 MT brownfield refining capacity in the next five years.